As the last truckload of furniture and equipment left Kingsway last night it was the end of an era for TVH. Associated Rediffusion took over the building in 1954, and began the conversion from what had been the wartime Air Ministry to the home of the infant ITV. Studios and technical areas were installed where steel shelters had stood for Winston Churchill and headquarters RAF staff. One member of the Marconi planning team which supervised the conversion was Phil Berkeley, now Head of Engineering Projects for Thames. Since TVH went on the air on 22 September 1955, it has been the base of ATV, ITN, Rediffusion, Southern, Scottish, TV Times and Thames. Now the building is to be ripped apart again, for IPC, and given a new name. The Lyceum has been associated with staff parties for almost as long as TVH with television. Many Rediffusion parties were held there, and Thames continued the tradition for its first two years. But now that Thames has moved to Euston, the Board has decided it would be inappropriate to hold parties there any longer. Chief advantage of the Lyceum was its closeness to Television House, particularly for staff involved in transmissions on the night of the party. The careful and elaborate plans made over several months by Administration and Engineering Departments have paid off. The Euston move has been completed more or less without mishap and on schedule. The last departments moved earlier this week, and all central London staff are now in their new accommodation — with the exception of Betty who opens the shutters of her new Club bar at 6.00 pm on Friday 13th! Friday 30 October, 8 pm as Sales Administration Manager Paul Cheffins loads the last sales booking chart. Sales Department was back in business by Monday. 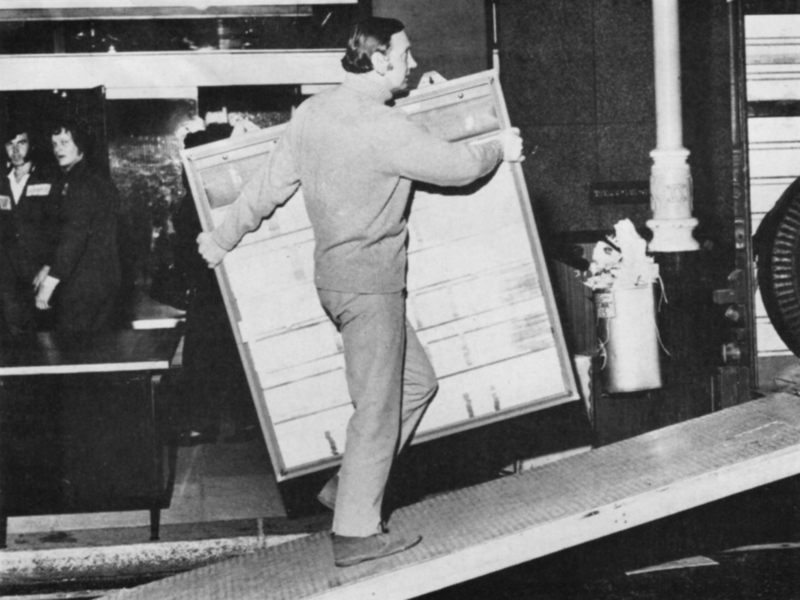 Casualties of the move included Maintenance Foreman Derek Drury (slipped cartilage) and the electric typewriter of Sales Director’s secretary Betty Wilson (smashed carriage). On the lighter side, Wanstead police telephoned on Monday, 2 November, to tell the company that old files were seen drifting down Wanstead High Street! In view of the recent council workers’ strike they are not pressing charges against Thames or against the refuse contractors who should have delivered them safely to a dump.